As you know from my last post, we have been travelling within Greece in the last weeks and were meant to be back to Thessaloniki, where we have our summer base, yesterday. 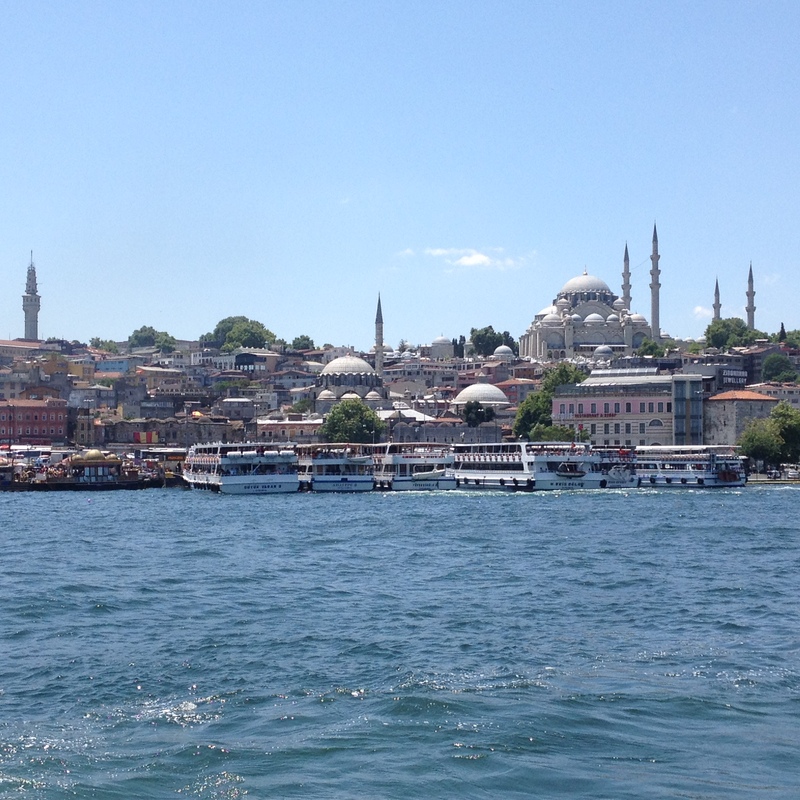 But as life has it, I am writing this post from a sunny hotel lounge in…Istanbul! Let me tell you how we got here. Yesterday, on our way back to the airport, we had a very near car crash. A crash which would most likely have been fatal for all of us, had it had happened. We then proceeded to return our rental car to Goldcar Rental in Koropi. We had experienced issues with them when we had picked up the car and we allowed half an hour to return the car this time. Their ATM wasn’t working and after FOUR(!!!) unsuccessful attempts to return our deposit, we knew we were very close to missing our flight back to Thessaloniki. We sat there, shell-shocked after the near-crash, furious following the car rental mishaps (which, from the sound of that office yesterday, seems to be the rule, not the exception!!) and got further annoyed when we realised that Ryanair’s “Keep Greece Flying” campaign had actually been so successful that there were no cheap available flights until the weekend!! There was only one thing to be done, hubby said. Since we had been given another chance to live and were not lying in a Greek ditch, we had the duty to live fully these “extra” moments, days, weeks and years we had been gifted. Logical trail of thought after this revelation? Putting us all on a flight to Istanbul, a city we had been talking about visiting for years! 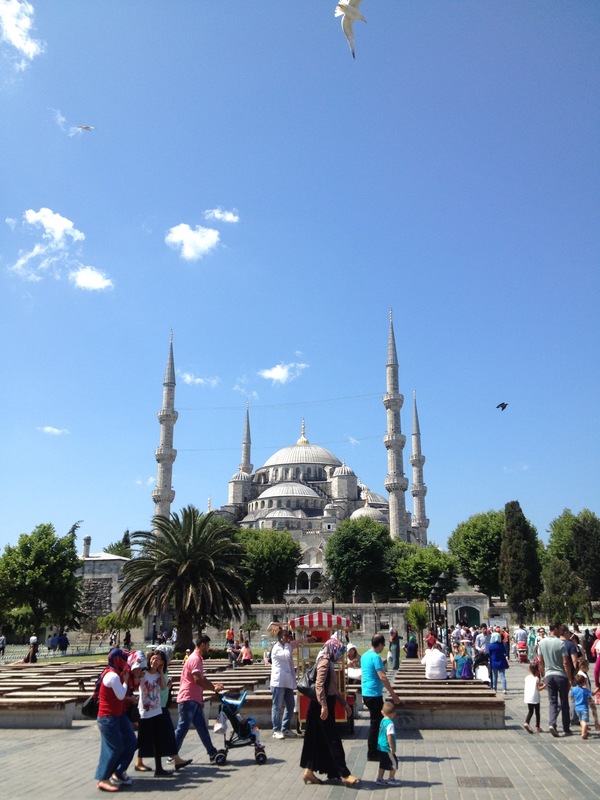 Unbeknown to us, Ramadan finished last night, around the same time we flew into Istanbul. We had arrived into the Muslim equivalent of Christmas Eve and felt it immediately in the people’s mood. 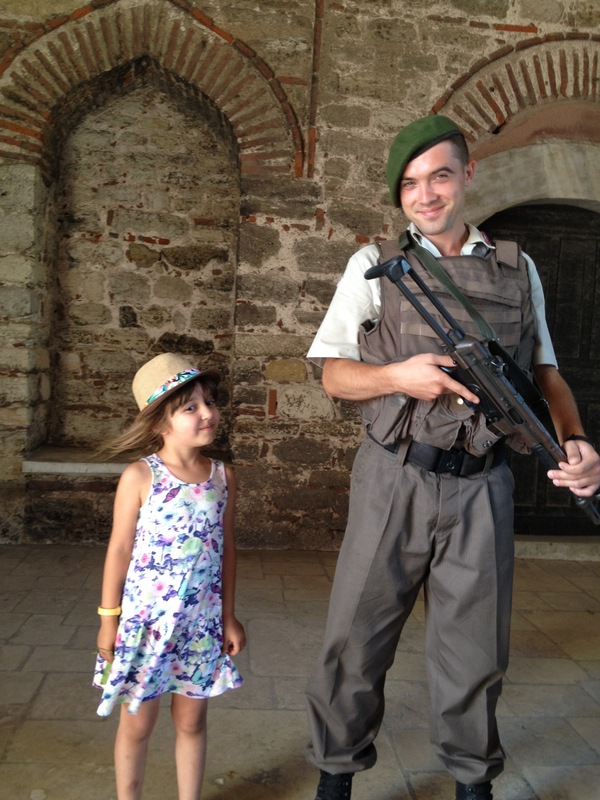 Emma needed a visa, as all British citizens do, so after we waited to clear the customs for an hour and a half, we were pulled out of line by a jovial young soldier who with evident love for children, lead us kindly to the right office. Visa was issued on the spot for a fee of 25 euro and we entered Turkey with a flow of celebrating Muslims who had come to visit family and friends from all over the world! Our family room, booked through Booking.com, is £42 per night, with beautiful hot and continental breakfast included. Do try their Turkish rose jam, it is as wonderful as I remember it from when I was a child! The rooms are smallish but very clean and functional. The service is that of a five-star hotel, fruit was sent to our room today, as soon as we returned, tired and dusty, from a day of exploration! After a filling breakfast, we walked five minuted down the road to take the tram. Tram tickets cost 4 lira per tocken. We had to purchase something from a small corner shop so we can change our 10 and 20 lira bills into coins in the automat. There is security in every tram station as, we have figured out, people like to take a free ride, when the opportunity arises :-). But the security guys are kind and helpful to the tourists, and even if they don’t speak English, they would show you in sign language what you are meant to do. Do change around 20 to 30 lira into tockens if staying for more than a day in Istanbul. The tram is handy for reaching all the landmarks and you will need one tram token each journey you take. Hint: push the gate firmly after inserting token, they are not like the ones in the London subway and we did look a sight this afternoon, when we got stuck and waved our tram goodbye from the wrong side of the barrier, all in 40 degrees! We did the sightseeing today with the clear intention NOT to spend on entrance fees. We thought it unwise, with a five-year old, who gets easily bored when looking at buildings and artifacts, in tow and considering the hefty fees for some of them! The only money we intended to spend was the Bosforus cruise. Emma loves boats and we thought that a two-hour trip would not be too tiring for her. She loved the sights but after yesterday’s events, got tired and slept, lulled by the waves. 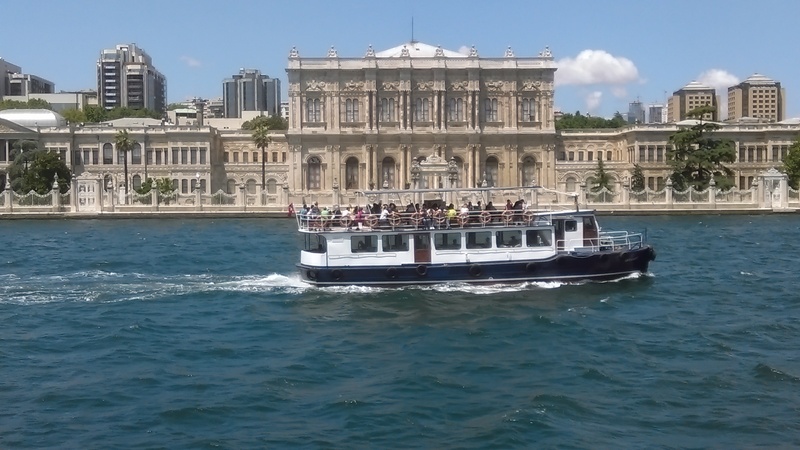 We enjoyed seeing Istanbul from afar, found fascinating seeing the two sides(Asian and European) and realised what an eclectic city this is, with skyscrapers and ancient mosques cohabiting harmoniously side by side. What we were not prepared to pay were extortional prices for water and food in the historic area! We are also finding it hard to haggle over everything, especially with older people, as we were raised to respect the elderly and goes against the grain to try and “cheat” them out of their merchandise. So, old man from the sweet shop, never mind, we are still enjoying that £6 halva and do not resent you riping us off ;-)! Our advice is, talk to the people in your hotel before you head out! We now know a good, local and reasonably priced place to eat and we have found out that when buying ANYTHING, drop the price by half and haggle :-), they will respect you for it! I am heading back to my family now. We will be here for another two days and I intend to write another update on Istanbul, on the bazaar and other wonderful places! Come back tomorrow night, if you enjoyed this post! How wonderful to do something like that on the spur of the moment! Such a good way to put a rotten few hours behind you. I like your husband’s attitude – and thank goodness that you didn’t crash. 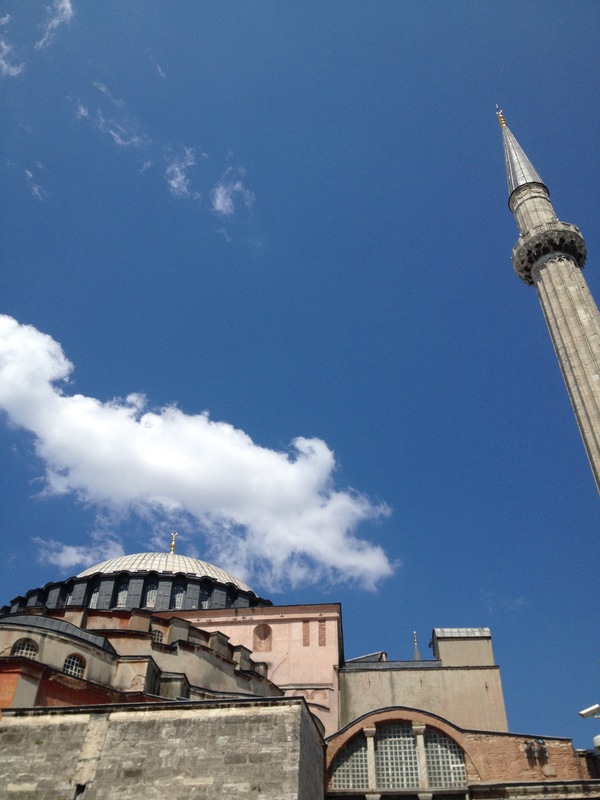 How wonderful to be exploring Istanbul, and at the perfect time. Best spur of the moment decision you will ever make!! I love how your husband chose to see the positive and you ended up having a wonderful time in an unexpected place! Wow, what an adventure and the perfect way to forget about those car rental people. Istanbul looks amazing! I love this Oane, you turns a bad thing in to an amazing thing and looks like you had a wonderful time. I wish I was there with you. wow I love how full of energy and vibrancy this post is. I agree you need to enjoy the moment. I was really shocked when we needed visa’s for Turkey. I am sorry for the car trouble and that near miss must have shaken you up, but what an adventure! That is somewhere I would love to visit – and you are so right, you have to embrace every moment and opportunity – hope you have enjoyed your bonus adventure! How scary to be involved in a near-crash. I’m glad to hear you are all OK. I’d love to fly off with my family on a spur of the moment and enjoy an adventure. Have fun!